By Christine Schmidt @newsbyschmidt March 20, 2019, 11:49 a.m.
$14 million. That’s how much money might not have otherwise made its way into nonprofit news outlets’ bank accounts without NewsMatch, the three-year-old, foundation-funded, end-of-year donation matching campaign. 93 percent of NewsMatch participants said the campaign helped them raise more money than they otherwise would have. The campaign caught the budding nonprofit news sector at a critical stage in its growth and is giving it a jetstream by helping coach newsrooms, funders, and individual donors into seeding its future. So — how did they raise all that money? And what did they learn along the way? “The thing that I see a lot of organizations learn is that there’s both an art and a science to fundraising. Most of all, there’s a template for fundraising,” said Jason Alcorn, NewsMatch’s project director and new vice president of operations for the American Journalism Project, a venture philanthropy effort for local news. Shih participated in the first round of NewsMatch in 2016 as the Voice of San Diego’s membership and events manager. Now she spearheads the News Revenue Hub’s involvement, helping to build capacity in those nonprofit organizations to carry out the campaign successfully and prepare for the fundraising cycle the rest of the year. NewsMatch has evolved over its three years, but it fundamentally zeroes in on tutoring outlets how to ask for donations, foundations on how to support and evaluate newsroom recipients, and also individual donors — almost 100,000 newbies already — in supporting journalism. The dozen foundations (and this year, Facebook) contribute to the match pool that gets sorted out after December 31 with lots of spreadsheets and checks from the Miami Foundation, the fiscal sponsor. The numbers change every year based on participants and the total pool, but in 2018, each newsroom could get up to $25,000 matched with a $1,000-per-donor limit. There were also certain incentives based on targets (like getting 100 new donors in this year’s NewsMatch period) to account for the different abilities of different newsrooms. “Those bonuses came directly from feedback we got after the 2017 campaign that organizations had their own record-breaking fundraising campaigns — they raised more money than they ever had before — but they still weren’t raising as much as we offered to match one-to-one because they were smaller, serving a community with less wealth and access to resources. 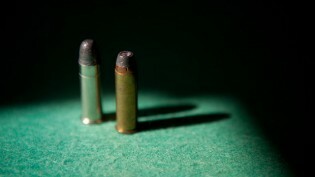 They wondered if that meant their campaign wasn’t successful in the eyes of NewsMatch,” Alcorn said. 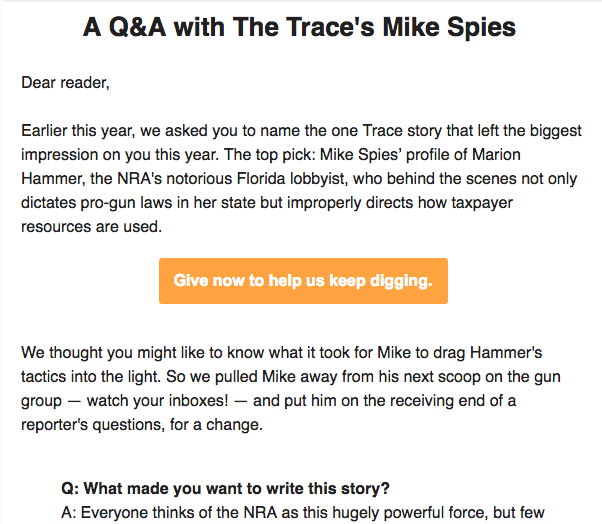 Organization: The Trace, reporting on gun violence and reform, originally funded by backers including Michael Bloomberg’s Everytown for Gun Safety. As special projects editor at The Trace, Miles Kohrman’s job involves product, editorial, and strategy — and NewsMatch. That’s a lot for one role at an organization, though the outlet is only as old as NewsMatch itself. “We came into this year with an understanding that we left some money on the table by not really leaning into it the previous year,” Kohrman said. He assembled a “NewsMatch strike force” of him and reporter Elizabeth Van Brocklin. Previously, editorial director James Burnett had taken the lead on engaging large donors and foundations to give their support: “In the history of this organization, this was the first fundraising campaign,” Kohrman said. Building out a small donor base is part of his mandate this year in refining The Trace’s reader revenue strategy, currently a “small slice” of its budget. The News Revenue Hub offers 12 to 15 example emails in a toolkit that participants can use or adapt for their own audiences, and Kohrman made sure to take advantage of that. He and Van Brocklin created personal appeal emails that featured someone in the newsroom, relying on the Hub’s template, but trying not to get too spammy. 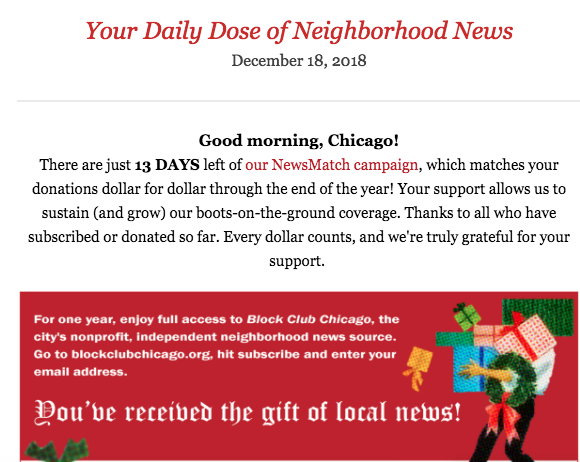 Organization: Block Club Chicago, a neighborhood-focused outlet that launched with a bang from the ashes of for-profit DNAinfo last year, raising $183,000 in Kickstarter’s most-funded local news campaign. You could say they know how to harness momentum. Photo of reporter Kelly Bauer interviewing a Chicagoan courtesy Block Club Chicago. Block Club Chicago already had a tremendous donor base from 3,000 people chipping in for the Kickstarter, but it’s also a subscription-based organization, with a paywall after five articles (not including breaking news). It’s also attached to Civil — we’ve mentioned them in these parts before — operating on a grant from the blockchain startup that runs out at the end of May. “During NewsMatch, instead of pushing our subscriptions in our newsletter and on social media and all the places we promote subscriptions as a way to support us, we flipped that to instead ‘donate to NewsMatch,'” Stephanie Lulay, BCC’s managing editor, said. While growing subscriptions is an important goal for them before the Civil grant ends, they already have 7,000 subscribers locked down, Lulay told me, which is more than halfway to their goal. BCC’s biggest success came in waving the NewsMatch flag in their regular email newsletters, which hit around 85,000 inboxes. The organization also experimented with hosting an event; NewsMatch’s guidelines allowed ticket sales and/or donations from an event to count toward the $25,000 cap, as long as the event happened within the Nov. 1–Dec. 31 window. BCC had offered a private dinner as a Kickstarter perk, but the NewsMatch cocktails-and-trivia event was hosted at a local bar and sold out all 30 tickets at $100 to $150. “We took NewsMatch as a reason to experiment with having a fundraiser like that,” she said. Organization: Center for Sustainable Journalism at Kennesaw State University. The Center was founded in 2010 with a $1.5 million grant from the Harnisch Foundation that lasted five years and has been self-sustaining since then, operating publications including the Juvenile Justice Information Exchange and Youth Today. 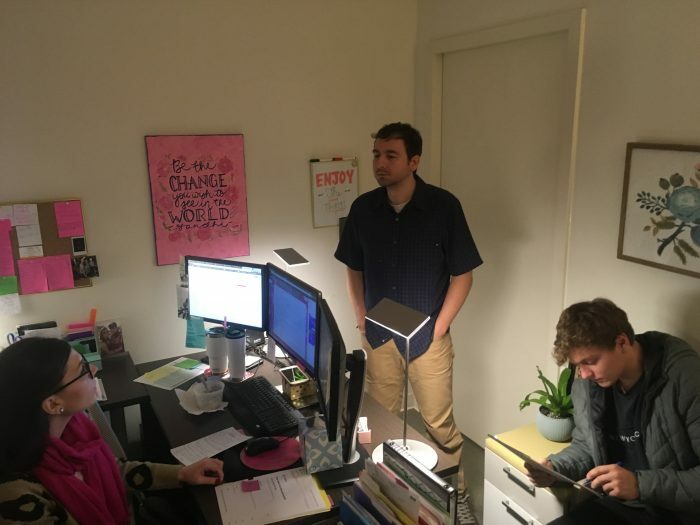 Photo of Chelsey Odom, web producer Chris Hayden, and Gabe Valeanu courtesy of the Center for Sustainable Journalism. The team at the Center for Sustainable Journalism entered NewsMatch 2018 with a mission and a secret weapon. “The incentive for reaching 100 people — that really got us thinking,” said director Leonard Witt, and the key was planning early. Gabe Valeanu, their 20-hour-a-week grantwriting intern since last May, was tasked with carrying out the campaign as the whole office chipped in. “This strategy with the 100 new donors and building your base — it points to a more important thing of building our community,” John Fleming, the executive editor, said. To tackle the donor goal, everyone in the office committed to reaching out to their personal contacts to start. Valeanu built up a database of emails that turned out to be more fruitful than the email newsletter lists from JJIE and Youth Today. They also leaned on alumni who have come through the Center: “We tried to figure out where we can find different people who could donate to us,” business operations manager and alumna Chelsey Tabakian Odom said. “We tried to start closest to home.” The Center has employed 80 students over the years as part of their experiential learning program (teaching them how to sell advertising and circulation for publications, among other things), at an annual cost of about $55,000. The Center is aiming for bigger donors, too, by cultivating an early-and-often relationship with them. Odom is starting a monthly lunch-and-learn series with leaders from the local business and journalism scene (about a half hour northwest of Atlanta) to highlight what the center does — and to ask for their contributions more than just once a year and in more forms than just money. “They’re our next set of advocates,” she said. And the intern responsible for the fundraising? Valeanu is a senior studying economics who isn’t super inclined to go into journalism — but he has a newfound appreciation for nonprofit legwork. 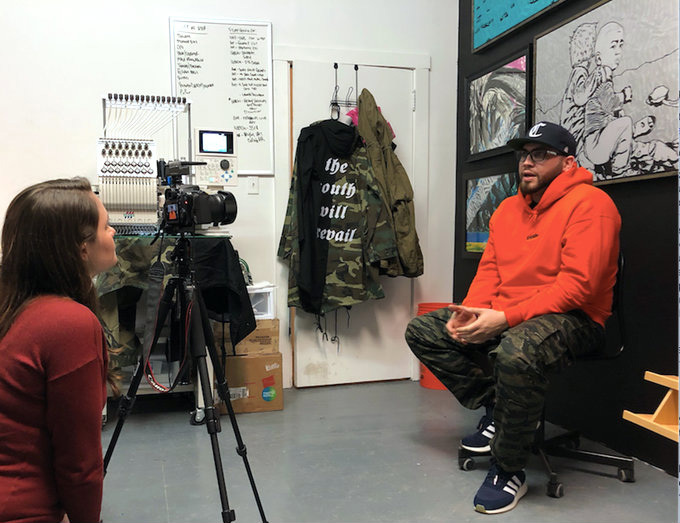 While fundraising should be a high priority for nonprofit outlets, the Center’s experience shows it can also be entrusted to a rising professional who could then take those lessons deeper into the media industry. Organization: Oklahoma Watch, a statewide investigative news organization focusing on public policy and quality-of-life issues. 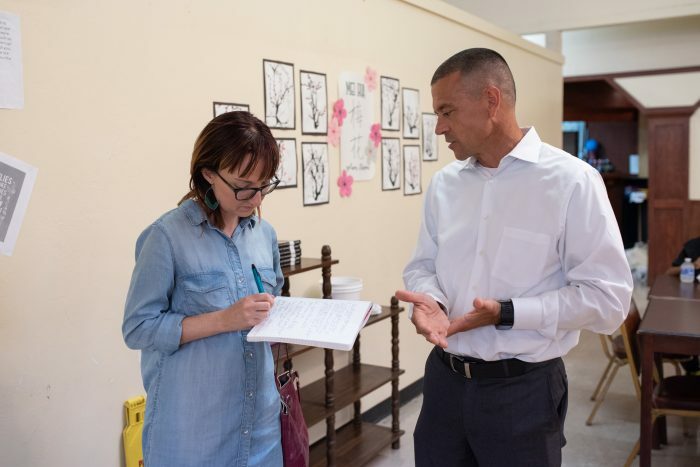 Oklahoma Watch education reporter Jennifer Palmer takes notes while interviewing Chris Brewster, Superintendent of Santa Fe South Schools in Oklahoma City on Aug. 28. Photo by Whitney Bryen/Oklahoma Watch. Drabek relied on the trainings and templates in the past, but she and Fritze have also tweaked Oklahoma Watch’s approach to make it fit its specific audience. This includes more picking up the phone and sending thank-you postcards, the latterof which News Match has now added to its toolkit. Drabek had previously introduced thank-you postcards for donors throughout the year, but they decided to create special NewsMatch branded notes as another personal touch. “Who knows if they’re reading the thank-you email,” she said. 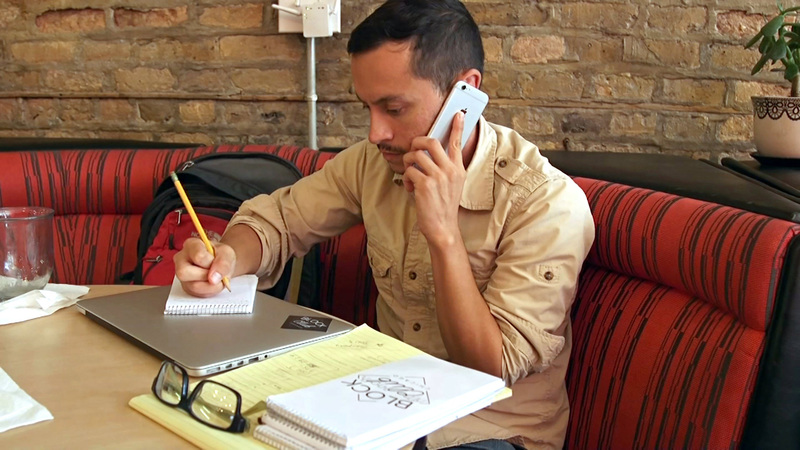 Image of Block Club Chicago reporter Mauricio Pena at work used with permission. POSTED March 20, 2019, 11:49 a.m.
Schmidt, Christine. "50,000 first-time donors? Here’s how four nonprofit organizations used NewsMatch to the fullest." Nieman Journalism Lab. Nieman Foundation for Journalism at Harvard, 20 Mar. 2019. Web. 23 Apr. 2019. Schmidt, Christine. "50,000 first-time donors? Here’s how four nonprofit organizations used NewsMatch to the fullest." Nieman Journalism Lab. Last modified March 20, 2019. Accessed April 23, 2019. https://www.niemanlab.org/2019/03/50000-first-time-donors-heres-how-four-nonprofit-organizations-used-newsmatch-to-the-fullest/.